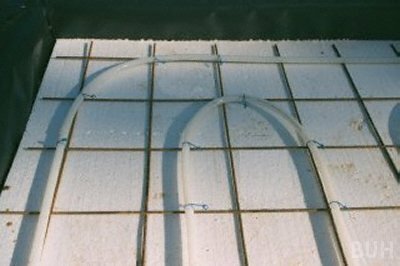 Wire ties twisted around the underfloor heating pipe and the mesh in order to attach one to the other. This method is not used in domestic properties these days. Please see the structural slab floor construction diagram for further information. The builder prepared the floor by laying expanded polystyrene insulation and then placed the mesh on top to cover the entire surface. Insulation should also be fitted around the perimeter to correspond with the finished slab height. The underfloor heating pipe circuits were then fixed to the mesh using wire ties as shown. It is best to keep the mesh is large pieces. Once all the pipe was laid the builder raised the mesh (with pipe fixed in place) and supported it all on blocks prior to the concrete being poured.